On May 2nd, Green Action Centre and the Downtown Winnipeg BIZ partnered to bring Dr. Larry Frank, Professor in Sustainable Transportation and Public Health at the University of British Columbia and President of Urban Design 4 Health, Inc., to Winnipeg for our event From A to B: Workplace Wellness & Our Environment. Employers have done a great job in bringing Workplace Wellness initiatives to the culture of modern workplaces. Yoga at lunch, employee gyms, mindfulness seminars; all of these initiatives have had a positive impact. But, we often forget about how employees get to work, how they get home, and how this travel time effects our health and the environment. While a portion of employees will partake in wellness initiatives, all employees make the commute to work (or not if telework is an option!). What can workplaces do to ensure they support employee health through examination of their transportation options? This event provided participants the opportunity to find out! So began Dr. Lawrence Frank’s keynote presentation, which gave key data linking health outcomes to our built environment. The presentation examined our environment and travel infrastructure, the behaviours that result (as well as the Exposures of the participants), measuring the Biological Response and the Chronic Disease outcomes. If we imagine humans as fish, and our built environment as the fishbowl, we can then measure the health to see whether the fishbowl has been designed well. How are the fish doing in the tank? In North America, we can now see the negative health outcomes of the way we’ve been designing our neighbourhoods since the 1950s. As we’ve sprawled out into the suburbs and bedroom communities, lowering the Walkscores of our neighbourhoods, we’ve seen obesity and asthma rise, as well as other chronic disease. The amount of time that the average person spends moving has also decreased dramatically. Dr. Frank’s work led to WalkScore in the 1990s, and he “walked” us through how the tool developed and the type of data that is used to assess the scores of addresses. Workplaces can benefit from locating in neighbourhoods with strong walkscores as their insurance premiums would be lower, and their productivity would be higher. By encouraging healthy, sustainable transport, they also see fewer sick days taken, more engagement and higher employee retention. Dr. Frank shared recent research to be published in 2018 titled Work and Home Neighborhood Design and Physical Activity in the American Journal of Health Promotion, where 1085 adults were used to “investigate the relations of perceived worksite neighborhood environments to total physical activity and active transportation, over and above neighborhood built environment.” The result? Mixed land use street connectivity was the most impactful on how people travelled. Not surprisingly, when participants both lived and worked in neighbourhoods with mixed land use, participants were most likely to have higher physical activity. Simply put, when there are destinations near workplaces, people tend to walk to them. Data was able to conclude the annual health cost savings per 1,000 people per 1% canopy increase, noting that a 10% increase in tree canopy is associated with an 18% reduction in obesity. After Dr. Frank’s presentation, we broke attendees into three groups to ciculate through three breakout sessions. 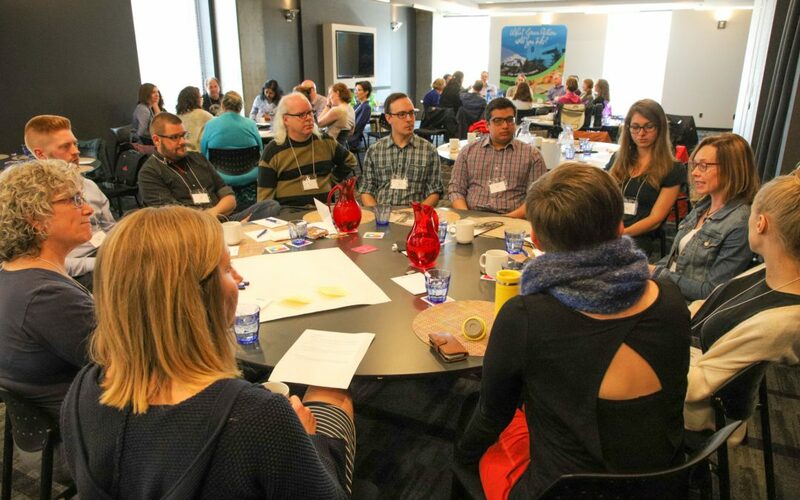 The breakouts session topics included, (1) Workplace Transportation 101 (featuring Christie Nairn from University of Manitoba), (2) Healthy and Sustainable Workplaces, and (3) Connecting Workplace Health to Our Environment. The following summaries include highlights from the breakout sessions. This session was facilitated by Christie Nairn from the Office of Sustainability at the University of Manitoba, who touched on a few points related to their Sustainable Transportation Strategy 2017-2022. Within that plan, the University has started to conduct a Campus Commute Survey, through Green Action Centre, which gives them the baseline information to move forward with transportation initiatives on campus. She noted that her favourite part of the survey is seeing the responses to the question ‘under ideal circumstances, how would you like to commute to campus?’. This question really outlines the potential for improvement on campus; people are willing to commute more sustainably, but now the challenge is figuring out how to turn their willingness into action! That is where education, promotion and continual reminders of the services your workplace offers is really important to helping elevate some of the anxiety of leaving their car at home. The groups discussed ways their workplace supports and promotes sustainable commuting. There were a number of great initiatives brought forward, including GoManitoba subscription for carpooling, secure bike parking, locker and shower facilities, Peg City Car Co-op membership, office bike fleet, event participation (Commuter Challenge, Bike Week, etc. ), and walking/ busing/ carpooling to meetings. There were many wish list items discussed when it comes to workplace commuting including, including active transportation allowances into health spending account, more frequent and reliable transit service, connecting wellness, sustainability, and transportation communications, rewards and incentives program for non-car transit, removing free parking, removing parking subsidies, office wardrobe for clothing storage, combined approach of incentives (EcoPass) and penalties (increase cost of parking), transportation options included in staff orientation, bike parking and carpool parking spots right outside the front and visible, and City-wide, connected infrastructure. Finally, workplaces recognized and discussed solutions for barriers which include, childcare and school transportation, strong car culture, hard to promote through communications and cut through a lot of noise, free executive parking, inexpensive parking downtown (compared with full cost bus pass), no buy-in or leadership from management, workplace location, long-term parking leases, and no sustainable funds. Mel Marginet from Green Action Centre facilitated this workshop by illustrating the strong connection between the health and well-being of employees and their work environments. When people feel valued, respected and satisfied in their jobs and they work in safe, healthy environments, they are more likely to be productive and committed. Stats Canada reports 85% of Canadian adults do not get the recommended minimum of 150 min of moderate to vigorous activity per week. The International Labour Office states that poor diet on the job is costing countries around the world up to 20% in lost productivity. This is comparable to a reduction of one day per week! Public Health Agency of Canada states that work performance improves up to 15% amongst physically active people. Participants report improved concentration, stamina and memory; and increased energy. A 2011 study determined partaking in physical activity outside is associated with greater feelings of revitalization, increased energy and positive engagement decreases in tension, confusion, anger and depression. Both the employer and the employee benefit from a healthy workplace. Canada Life in Toronto showed a return of $6.85 for every $1 invested in its Workplace Wellness program. There were some great health and wellness initiatives highlighted and discussed within the groups including. Health In Common offers a $300 Sustainable and Healthy Living Fund per employee (can be used for bus passes, bike, running shoes or other items to support healthy, sustainable living), developed a Healthy Workplace Document, in consultation with employees, reviewed annually, made space for secure, indoor bike parking, and chose a location in the Exchange to be close to transit and within walking distance to amenities. The Downtown Winnipeg BIZ has one printer located away from workstations to encourage walking throughout the day and walking and cycling to meetings is encouraged. At Green Action Centre, we all participate in daily lunch stretches, provide a standing workstation and balance balls, offer monthly wellness initiatives and quarterly team building activities, provide transportation allowance, and have a flexible work schedule policy (including telecommuting). At Assiniboine Credit Union, they have a subsite subscription to GoManitoba to showcase all transportation options and programs at their workplace, encourage carpooling, transit and bike commuting, participate in the EcoPass program to give employees a reduced rate on a bus pass, track their programs through annual commuting GoHappy surveys and reports to see the impact on employee travel and GHG emissions, and have upper management buy-in to programs ensures they are prioritized. There were many wish list items discussed when it comes to workplace health and wellness including, timed standing, walking, or stretching breaks every 15-20 minutes, healthier food options at meetings, lunchtime yoga, promoting outdoor winter activity, formal wellness committee, and health/ wellness material in intranet/ internal newsletter. The third and final breakout session was an opportunity to connect all initiatives, programs, and ideas shared throughout the afternoon with Liz Shearer, our Commuter Challenge Coordinator at Green Action Centre. The promotion of health and sustainability in the workplace is closely linked, and making the case for one often leads to benefitting the other. Making the case for sustainable transportation can be achieved through promoting the many health, environmental, and economic benefits to employees at your workplace. Transportation is the largest contributor of greenhouse gas emissions in Manitoba, which contribute to climate change. If the majority of people drive to work alone, this results in a significant abundance of vehicles on the road, heavy traffic congestion and idling at peak times of the day. When employees commute in a sustainable way (walking, cycling, public transit, or carpooling) they are reducing their carbon footprint and improving local air quality. When employees actively commute to work, they are increasing their daily physical activity and therefore have better overall physical health. Increasing wellness as a priority at your workplace will enable employees to improve both their mental and physical health, making them more productive overall. Healthy employees work harder and take less sick time which can benefit employers financially. By offering incentives for sustainable commuting, employers can experience overall savings. Employers can reduce demand for parking and spend less on subsidized parking for their employees by offering incentives for transit, carpooling, cycling and walking that cost less and have positive health and environmental impacts. Providing a range of commuting options can also assist in recruiting and retaining employees, which can help reduce costs associated with employee turnover. Green Action Centre and the Downtown Winnipeg BIZ would like to thank our sponsors and those who attended From A to B: Workplace Wellness & Our Environment! For all things related to workplace commuting, visit our Workplace Commuter Options page for resources and services.